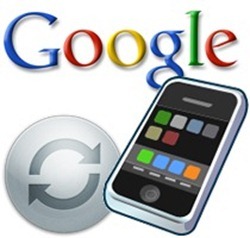 Google has updated Google Sync for iPhone, iPod touch and iPad. Three new features have been announced. Google Sync is used to keep your iOS device’s Mail.app, Calendar.app and Contacts.app in sync with your Gmail, Google Calendar and Google Contacts (respectively). This isn’t actually any app that can be downloaded from the App Store; Google Sync is a service which you can set up between your iOS device and your Google account with ease. iOS’ built-in Mail app only searches for locally stored emails when you use search. Now, however, you can search all your emails in Gmail. 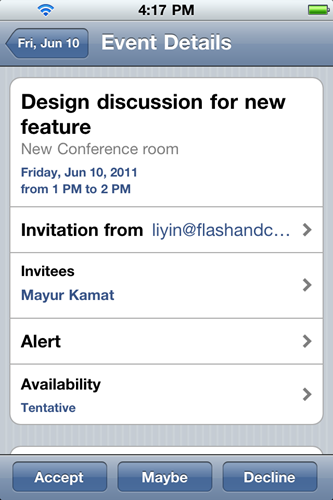 Secondly, you can now accept, decline or edit calendar events directly from the built-in Calendar app for iOS. Lastly, you can now send email from your desired address instead of a fixed address. Gmail has a feature which allows you to “Send Mail as” from another email address. I have two accounts set up in my Gmail: a @live.com and a @gmail.com account. 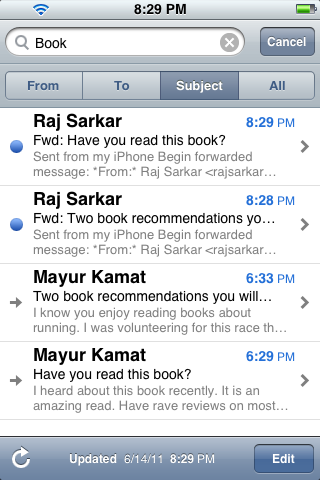 So, with the new update, iOS’ mail app will allow me to send email from my @live or @gmail account. These new features are up and working for Gmail and Google Apps accounts. You can set up your own Google Syncing magic on iOS devices like the iPhone, iPod touch and iPad by following these instructions.